Caption: The octopus ( /ˈɒktəpʊs/; traditionally, plural: octopuses, see below) is a cephalopod mollusc of the order Octopoda. Octopuses have two eyes and four pairs of arms, and like other cephalopods, they are bilaterally symmetric. An octopus has a hard beak, with its mouth at the center point of the arms. 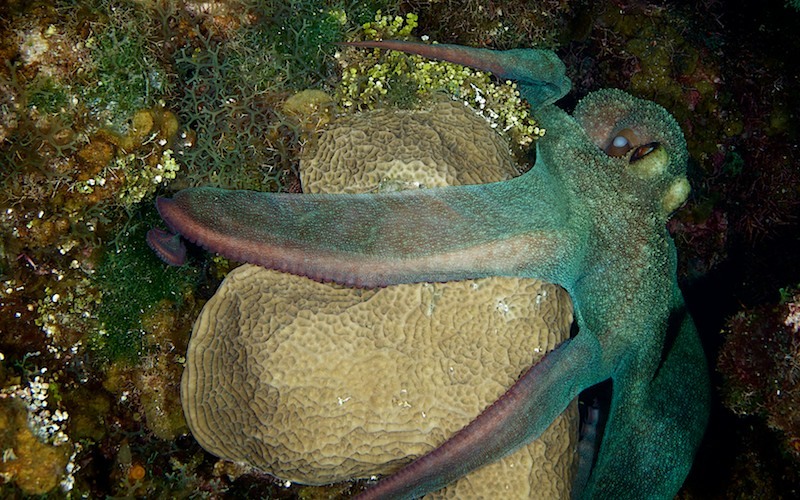 Octopuses have no internal or external skeleton (although some species have a vestigial remnant of a shell inside their mantles), allowing them to squeeze through tight places. Octopuses are among the most intelligent and behaviorally flexible of all invertebrates. The octopus inhabits many diverse regions of the ocean, including coral reefs, pelagic waters, and the ocean floor. They have numerous strategies for defending themselves against predators, including the expulsion of ink, the use of camouflage and deimatic displays, their ability to jet quickly through the water, and their ability to hide. An octopus trails its eight arms behind it as it swims. All octopuses are venomous, but only one group, the blue-ringed octopuses, is known to be deadly to humans. Around 300 species are recognized, which is over one-third of the total number of known cephalopod species. The term 'octopus' may also be used to refer only to those creatures in the genus Octopus. A group of octopuses is called a consortium.